When it comes to concurrency, check out Java and Kotlin's chosen champions: Futures and Streaming for Java and the experimental coroutines for Kotlin. To keep the article focused, I deliberately left out performance to write about code readability. linear to constant — or for the more mathematically inclined, from o(n) to o(1). Callable: A Callable is a “task that returns a result.” From another viewpoint, it’s similar to a function that takes no parameter and returns this result. ready.” In other words, it represents a wrapper around a value, where this value is the outcome of a calculation. 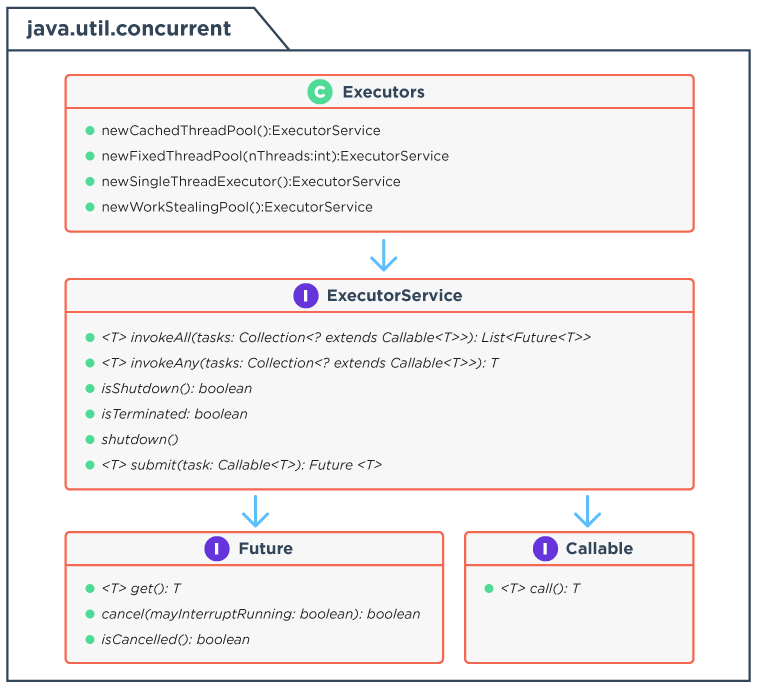 Executor Service: An ExecutorService “provides methods to manage termination and methods that can produce a Future for tracking progress of one or more asynchronous tasks.” It is the entry point into concurrent handling code in Java. Implementations of this interface, as well as more specialized ones, can be obtained through static methods in the Executors class. Calling our services using the concurrent package is a two-step process. Form a stream of service names. For each service name, create a new dummy service initialized with the string. For every service, return the service’s getContent() method reference as a Callable. This works because the method signature matches Callable.call() and Callable is a functional interface. Create a new executor service — any will do. Pass the list of Callable to the executor service. and stream the resulting list of Future. For every future, either return the result or handle the exception. List < ContentDuration > results = executor. Going back and forth between collections and streams. Handling checked exceptions in lambdas. The leading design principle behind coroutines is that they must feel like sequential code but run like concurrent code. They are based on the diagram here. Nothing beats the code itself, though. Let’s implement the same as above, but with coroutines in Kotlin instead of Java futures. This is standard Kotlin extension property code, but notice the CommonPool parameter. This is the magic that makes the code run concurrently. It’s a companion object (i.e. a singleton) that uses a multi-fallback algorithm to get an ExecutorService instance. outside the block to be assigned inside it. The Future API is not so much a problem than the Java language itself is. As soon as the code is translated into Kotlin, the readability significantly improves. Yet having to create a collection to pass to the executor service breaks the nice functional pipeline. For coroutines, the only compromise is to move from a var to a val to get the final results (or to add the results to a mutable list). Also, remember that coroutines are still experimental. Despite all of that, the code does look sequential — and is thus more readable and behaves in parallel. The complete source code for this post can be found on GitHub in Maven format.